Every year, on a special weekend in July, car enthusiasts from around the country gather in Pittsburgh’s Schenley Park for the Pittsburgh Vintage Grand Prix. Like wild flowers, the hillsides come alive with the vibrant colors of classic cars. The Allegheny Region of the Porsche Club of America makes quite a statement with Porsches both classic and contemporary. Stroll among these beautiful driving machines and imagine magnificent “Porsche Fields Forever”. 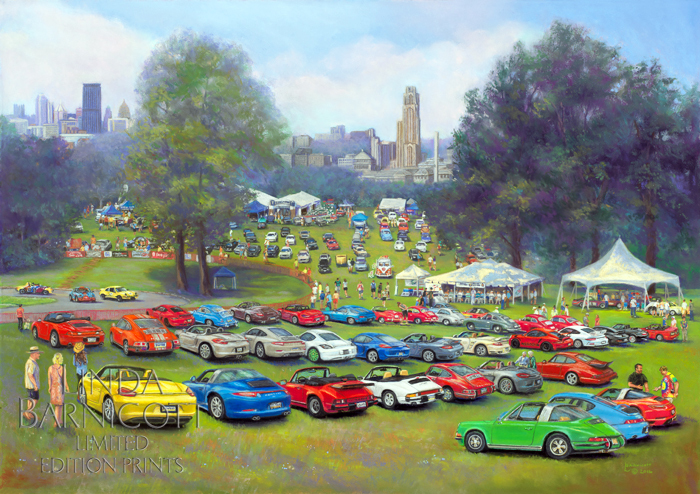 A portion of the proceeds from the sale of “Porsche Fields Forever” prints go to Autism services and Allegheny Valley School.